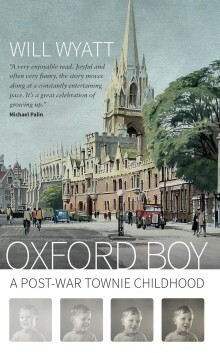 This is one boy’s tale of growing up in Oxford in the forties and fifties. It is a foreign land of being caned on hand and bottom, of teachers washing out a child’s mouth with soap as punishment for swearing. It was a time of conkers, fag cards and prozzie watching, when children asked strangers to take them in to the “flicks”, of collecting autographs in the Parks where that nice man asked the way to the gents. . . .
For this boy a scandalous act opened the door to everything important in the life that followed. His mother, who looked up to the “proper gentry”, was from a large Oxfordshire family in which several of her apparent siblings were her nephews and nieces. There was Aunty Daisy with her missing finger, who liked the American servicemen, and Uncle Stan, who took cash to buy his Jaguar while his brother rode passenger with loaded shotgun. The boy’s father, wary of those who “talked poundnoteish”, came from an even larger, East Oxford family in which the boys were bricklayers whose hobby was diddling bookmakers and some of the girls provided R and R for undergrads. It is a picture of parents providing a rock steady home as they improved their position in life and encouraged their son to catch his “golden ball”. He was fortunate in being guided by gifted teachers through the teenage years of discovering music, grappling with frothy petticoats, untold hours of sport and wasting time trying to imitate Harold Pinter. Oxford Boy provides a vivid picture of a long-lost city and of a childhood transformed by an unexpected event. Will Wyatt worked for the BBC as a producer, head of documentaries and managing director of television. He has been on the boards of a bookmaker, a manufacturing company and a media consultancy, and was chairman of the University of the Arts London and the Teaching Awards. He has written two previous books: The Man Who Was B. Traven (Cape, 1980) and The Fun Factory: A Life in the BBC (Aurum Press, 2003).